Ajahn Cittapalo conducts an intermediate/ advanced meditation class for approximately one hour. Ajahn Cittapalo reminds us not to try and stop or control anything, but instead to have a kind awareness of what’s going on in our mind and to treat everything that arises as a friend. As well as confidence in watching very closely what is happening so that we see what is going on and learn. Ajahn Cittapalo conducts an intermediate / advanced meditation class for approximately one hour. Recorded at Dhammaloka Buddhist Center, Perth, Western Australia. Ajahn Cittapalo conducts an intermediate/ advanced meditation class for approximately 1 hour. Recorded at Dhammaloka Buddhist Centre, Perth, Western Australia. Ajahn gave a brief description of meditation and then guided us through a body sweep and relaxation meditation. Although not totally suited to beginners this meditation was easy to follow and a pleasure to do. After the meditation Ajahn opened to Q&A with some of his frank answers and descriptions making the entire audience laugh. After the Q&A Ajahn gave a brief talk on how he became a monk and what life is like for a monk at Bodhinyana. Again Ajahn had the audience laughing. Ajahn begins by explaining what meditation is likely to be to beginners, those of us that have never meditated before. Ajahn brings our attention to our attitude when we wish to meditate, if our mind isn't settled or is in the negative, we struggle. Ajahn further explains some of the hindranses that cause us to lose our focus during meditation. The clock on the wall, the traffic going past. Ajahn encourages us to simply be an observer and not to engage in these distractions. 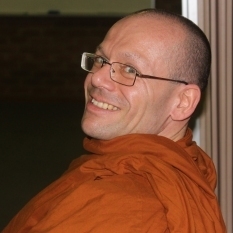 To start the meditation, Ajahn encouraged us to relax, get comfortable and just be. Ajahn guided us through a full body scan before guiding us in a 30 minute meditation. Just be here, beautifully cool room, nice people around us. After meditation Ajahn gave us a talk and opened to questions after bringing us all to laughter with light hearted humour. Ajahn began with base instructions on how and why we meditate, keeping it nice and simple for the beginners and the more experienced alike. A refresher never hurts. Ajahn then led the full house through a 30 minute guided meditation. After the meditation Ajahn offered this advice to beginners:- Don't make it a chore or a burden, make it a pleasant, easy for you, experience. If you aren't enjoying it, shorten the time. Gradually extend your meditation time, don't make it a job.